NYC, 02/06/2019, 6:30PM. Screening movies by an Oscar winning animator. 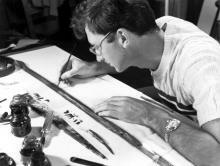 Scottish-Canadian animator Norman McClaren created films unlike anyone had ever seen, reframing the language and techniques of abstract animation. His 60 films earned him over 200 international awards. Pablo Picasso called his Oscar-winning short “Neighbours,” “the greatest film ever made.” In addition to developing groundbreaking methods in animation drawn on film, visual music, pixilation, and more, he founded the first animation studio for Canada’s National Board of Film. Filmmaker Donald McWilliams, who worked with McLaren at the NFB and directed the documentary Creative Process: Norman McLaren, has curated a selection of McClaren’s films from the Library’s archives that were produced between the 1940s and ‘70s. Michael Fukushima, Executive Producer of the English Animation Studio at the National Film Board of Canada, will present the screening.